The Ecobee3 has long been our favorite smart thermostat for several reasons. The Alexa integration is obviously key, and we love the fact that it works with a remote sensor so it can adjust your heating and cooling based on the temperature in an area of your house that gets a lot of traffic, instead of whichever random hallway that happens to house your thermostat. 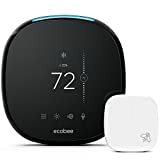 The 3 is still a terrific thermostat, and it’s on sale right now on Amazon at its lowest price ever, but there’s a new sheriff in town: The Ecobee4. It’s better in every way — it can even replace your Amazon Echo as an Alexa speaker — and it’s discounted right now on Amazon even though it was just released!